Reigning champion Casey Stoner put down a marker for Sunday's British MotoGP by setting the quickest time in practice. The Australian, fourth fastest in Friday's rain-hit morning session, produced a brilliant lap in the afternoon session at Silverstone. Ben Spies was second quickest in largely dry conditions, with Alvaro Bautista, who crashed in first practice, third ahead of Nicky Hayden. 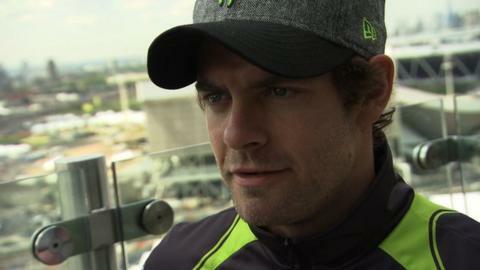 Britain's Cal Crutchlow was eighth fastest with Valentino Rossi 11th. "Sadly, it could be last time the British fans see Casey Stoner...The Australian has been the fastest rider on the planet in the last few years and watching him live is just something else. " Repsol Honda rider Stoner, who is retiring at the end of the season, is second in the World Championship standings, 20 points behind leader Lorenzo. "I really enjoy the layout of this track, but the new surface which they have put down in places is actually worse than we had last year," he said. "The track is really bumpy, which makes the bike quite nervous, but the grip was OK."
The rain that hit the circuit overnight and into Friday morning was nowhere to be seen as second practice got under way at an overcast Silverstone. After a wet morning session, most of the field were out early to make the best of the dry conditions, but they were forced back to their garages when the rain returned just 10 minutes into the session. After a short break, they were back out again as the clouds dispersed and the sun broke through to bathe the Northamptonshire circuit in sunshine. It wasn't long before the times started to tumble with Yamaha's Spies, who crashed out in the race last year and came off in first practice, and Stoner trading the fastest times early on. Spies set a blistering time just before the chequered flag dropped, but Stoner edged him out by 0.034 seconds on his final lap. Crutchlow, who is hoping to compete in his first British MotoGP after crashing out in qualifying last year and missing the race, was a respectable eighth fastest, one place behind championship leader Jorge Lorenzo and seven-tenths of a second off the pace. Second practice saw no repeats of the crashes which occurred in first practice when Spies and Honda Gresini's Bautista were thrown from their bikes at Stowe Corner within a few minutes of each other. Both were unhurt. Lorenzo, who was only eighth quickest in the morning, said: "I didn't feel confident with the rear tyre in the wet during the morning session and I didn't feel comfortable in the dry as there was too much wind. "But it was a normal day, not bad because I didn't crash but not good because the position wasn't great. Hopefully we can improve the bike and Saturday will be better." Nine-time world champion Rossi raised hopes by finishing fastest in the opening session, but slipped down in the drier afternoon session. "This morning was very good in the wet and we were very happy," said the Italian. "So I think we can be competitive in a wet race. "But in the dry, we had a lot more problems. This track is very difficult and you can lose a lot of time with a small mistake. We will have to work to be competitive in the dry." 1230-1430 - BBC Two + HD and Online: MotoGP: Silverstone. Also commentary on warm-ups and Moto2 from 0845-1255 on 5 live sports extra. Race commentary from 1300-1400 on BBC Radio 5 live.